Winter weather conditions can catch even the best drivers off guard. 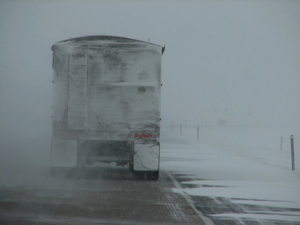 Driving a tractor trailer in serious winter weather conditions requires a specific set of driving skills for all drivers, especially tractor trailer drivers. Driving in snow and on ice is risky due to less stop time, poor visibility, poor traction, and the unpredictable drivers around you. Circle Check– Before you leave, complete a circle check to ensure that the defroster and heater are working properly. Make sure all wipers, lights, mirrors, and fluids are working, clean, and topped off before your departure. Slow down-Most accidents occur due to increased speed. During winter weather, driving the speed limit may be legal, but it is often too fast for snow covered or icy road conditions. Slow down and take your time. Keep a safe following distance– Leave plenty of room between your vehicle and the one in front of you. Chances are, if the leader makes an error, you will too. Use good judgment– If the weather gets too bad, find a rest stop or a safe area to pull off. Never pull off on the shoulder. Due to low visibility, other vehicles can easily mistake your vehicle as being on the road. Braking– Do NOT use the Jake brake on icy roads. Instead, pump the brakes, but be sure not to over brake when the truck isn’t straight. The truck will slow down but the trailer will not. Keep all exterior lights clean– When you are able to stop in a safe place, clear all exterior lights off of snow and ice. Keep everything clean so you can be seen. Pack winter driving essentials– Besides the mandatory roadside emergency kit, pack extra food and clothing. If an emergency occurs, get help, but be smart. Use your best judgment. Make a call if possible. Stay inside and wait for help to arrive. If you or a loved one has been injured in a truck accident, don’t delay, contact the attorneys at The Cochran Firm New York, today!